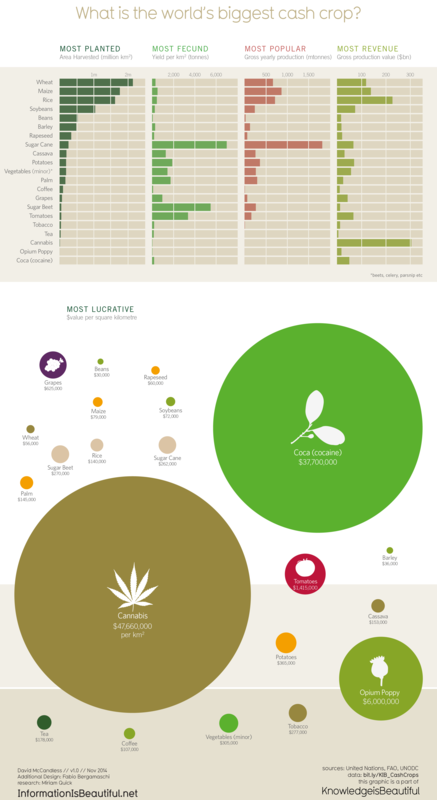 information is beautiful What is the World’s Biggest Cash Crop? Yep Cannabis makes serious dough. Curious why so many US states – Washington, Oregon, Alaska, Colorado – have decriminalised or even legalized the drug? 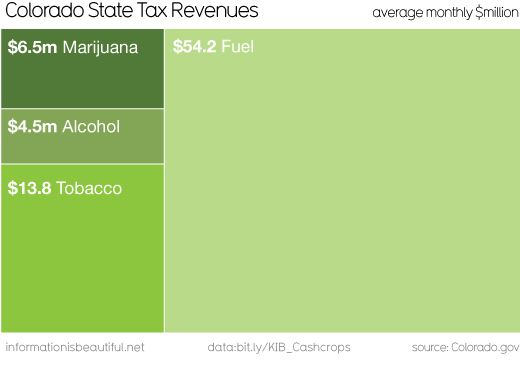 Because state legislators are getting high on another kind of green. How long before other cash-strapped governments around the world follow suit? We scored some data on yearly harvested area, production weight and wholesale value for the most common food crops from the UN Food and Agriculture Organization, and used it to calculate yield per km2. Then we went sniffing around in various UN World Drug Reports and performed some backroom calculations to cook up some broadly comparable figures for illegal drugs – cocaine, heroin and the mighty marijuana. Data on illicit substances is, like the peeps who sell them, more than a bit sketchy. For example, the UN data on dried coca leaf production (the raw material for cocaine powder) is based on only the top three coca-producing countries – Bolivia, Colombia and Peru. And the price and purity of coke varies, so we made some assumptions here.